Getting to the top of a mountain is only half the trip, they say. Measured in distance this may be true. Measured in time it is not. Places involved in our descent from Mt Kilimanjaro. Our ascent of Kilimanjaro was slow and circuitous. It was played that way in order to give our bodies time to acclimatize, our minds the wonder of the journey, and our legs some rest in the battle against gravity. The descent, on the other hand, reversed these priorities. Robert released us to journey from Uhuru Peak to Barafu Camp at our own pace. "It is hard to lose the trail in the daylight," he said. "Try skiing the scree" (translation: jump downslope and let your feet slide with the rolling gravel!). Jason stops at Stella Point on the descent from the rim of Kibo. He was right. We hopped, bumped, and avalanched our way off the rim. The 4,000 foot challenge of the night was covered in less than two hours. It was our brakes, not our engines, that overheated. Eventually, the tent-village of Barafu came into view. As we approached an amazing thing happened. The porters (who had waited there for our return) came out to greet us in song. They sang, clapped, offered each of us a chair and a cold orange drink. It was celebratory and uplifting (and more than a little humbling, given the athleticism of the porters). Harmonica-man played. Maro enthusiastically led the chorus. Despite weak knees, we couldn't help but dance and whoop together! It was a Chagga carnaval! Maro led the celebration of our return. Following the mini-celebration, we collapsed into our tents. A short rest was granted while a meal was prepared, then we were rousted out. We ate, repacked, and continued downslope. The day was far from done; it would be a 21-hour test of endurance by the time we stopped for sleep. Our journey went from glacial ice to alpine desert to forest in a single day. It was a rugged downhill trek. On the plateau below Barafu Camp some oddly built wheeled contraptions were parked beside the trail. Robert called them "Kili carts." They were used to carry injured climbers down the mountain. I asked how often the carts were put into action. Robert pawed his chin for a moment and then suggested that one person is carted down for every five groups he leads. Later that day, as proof of Robert's claim, a shout caused us to jump off the trail. A cart whizzed by. An older fellow was aboard, wrapped like a fish taco. As he passed I remembered seeing his face on the ascent above the Barranco Wall. At the time he was moving slowly. Now he was bouncing along with white-knuckled velocity. A group of five or six porters were alternatively lifting, pushing, or being dragged by the rescue stretcher. I have no idea what ever happened to him. It looked to be a terrifying exit. Tommy stands beside a "Kili cart" This unicycle "vehicle" is used to carry/roll injured climbers over rugged terrain. Our summit climb in the night had measured 4,248 vertical feet. Our descent on that same day was twice that: 9,170 vertical feet. Taken together, without sleep, it was physically crushing. Jason later told me that an app he carried claimed he burned 10,000 calories in that span. If his app was correct, the caloric burn of that one day alone was equal to the effort of running three full marathons, back-to-back. My body felt like I had been run over by a full marathon . . . of stampeding wildebeests! Late in the afternoon we reached our overnight stop at Mweka Hut. The tents were pitched by the time we arrived. Everything was drippy and damp, but we didn't care. Tommy and I went down for the count. In the morning we had an official ceremony marked by speeches and recognitions. The porters sang another round of "Jambo Bwana," the Kilimanjaro song. We hugged them, tipped them, and said our goodbyes. Their muscle facilitated our experience and we were grateful. No doubt, after they left us, they made their way back to the starting point to repeat the cycle. We, on the other hand, turned our noses toward home. 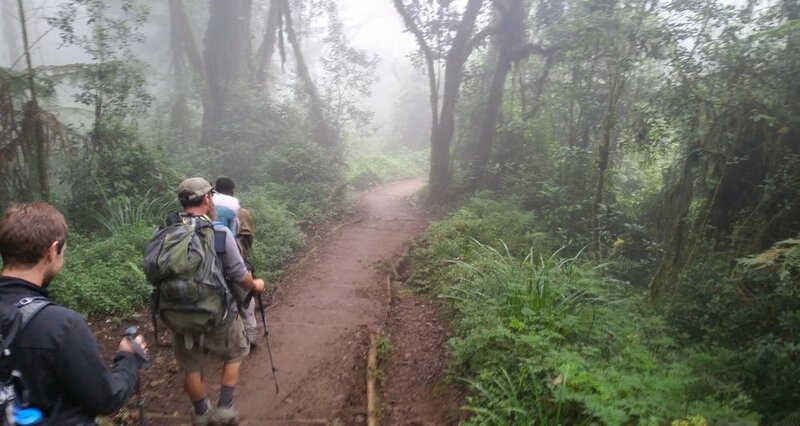 The last leg of the journey on foot was a four hour hike through forest to Mweka Gate. This required another descent of 4,265 vertical feet. Monkeys and birds played in the trees above our heads. Some trekkers have reported seeing elephants passing this way. We didn't. An amazing aspect of Kilimanjaro is experiencing many different biomes. Dense forest surrounds the base of the mountain. The trail eventually emptied onto a muddy road. From this point supplies are sent up via porters. "Kili carts" also meet their ambulances here. I remember thinking how odd it was to see tire tracks again. Had we been gone that long? Further down the trail that had become a road we came to our very last Kilimanjaro National Park sign. On the back of the Mweka Gate marker was bon voyage wish. Our group signed the guest book in the ranger station and posed for another picture. No doubt, we smelled even stronger than we looked. Our sturdy group came off the mountain and met the bus at Mweka Gate. Gear was strapped on the top of the bus. We climbed aboard. A hotel room with a hot shower and a soft bed was now just a few hours away. Note: While waiting for our bus, I asked a local fellow about coffee. I have enjoyed many gallons of Tanzanian Peaberry in my time. I wondered if it would be possible to see a coffee bush. He consulted a neighbor and the two of them took me to a banana grove across the road. There we found what we were looking for. I purchased some bags of coffee as souvenirs at the shop below Mweka Gate. The packaging turned out to be better than the flavor. But just outside the shop I found this bush growing under some banana trees. Further downslope are many coffee plantations. Here are some coffee beans picked from the bush.